The stench that greets motorists and passersby on the Nyanya-Karu-Jikwoyi road, just after the St. Mary’s Catholic Church, is enough notice that a horrific refuse dumpsite is around. Situated not far from the church and close to residential areas, shops and the Karu Market, the dump serves the interests of scavengers and animals that seek food remnants. The danger is that the space beside the dumps site has been turned into a football field by young people and there is a watercourse along the dump that can be used by the “footballers’’ after match. The refuse sometimes spills to the road, the development that has been a source of concern for the health of motorists, passersby, residents and shop owners around the area. Some of the concerned residents and motorists say they imagine the long term effects of the pollution and what the area can turn out to be in future. Even, Mr Musa Alhassan, suspected to be a scavenger in the dumpsite, says although the dump is his source of livelihood, the stench makes him nauseated. “I come here to pick plastics and metal to sell to people and the truth is that I get a lot of them here because the dirt is much. “Sometimes, I feel like vomiting when I am picking these items because of the smell. There are so many rotten things here and it smells terribly’’, he says. Similarly, a shop owner in the area, Mrs Chiaka Chibuzor, complains that the presence of the dumpsite discourages customers from coming in to her shop and others around the place. “We really try to get by here because people practically have to cover their noses when they stop by and this does not allow them to stay’’, she complains. Mr Audu Dauda, a tricycle operator, says being stuck in traffic around the dumpsite or having his tricycle breakdown there is his nightmare, appealing to the concerned authorities to find a permanent solution to the problem. 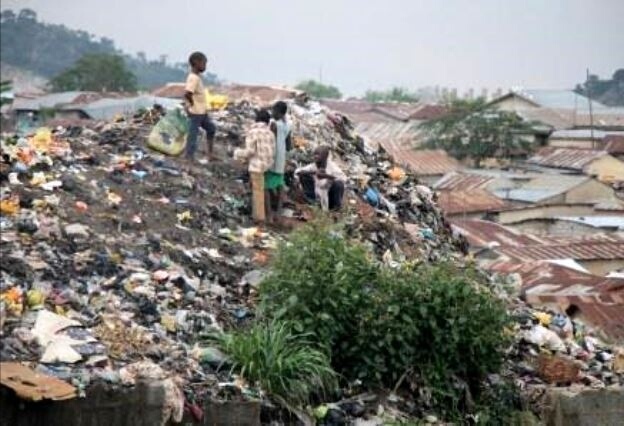 Warning against disease outbreak in the area, Miss Precious Agaecheta, Programmes Officer, Youth Initiative for Sustainable Development in Africa, says the implication of having such a dumpsite in the location is gruesome. According to her, the wastes in the dumpsite are both biodegradable and non-biodegradable — plastics and nylon bags — especially from the nearby market. “Research has shown that plastic items can take up to 1,000 years to decompose in landfills, this poses a great hazard on the environment as the dumpsite cannot be considered for other activities in future. “These wastes eventually rot and produce harmful carbon-dioxide and methane gases which are both greenhouse gases and cause global warming’’, she explains. She observes that open dumpsites pollute the air that is inhaled and emit obnoxious odours and smoke that cause illness to people living in, around, or close to the dumpsites. Ezinne says the waste from healthcare centres and other medical waste disposed in dumpsites, mixed with domestic waste increase the risk of infection, especially on the waste workers and rag pickers. She says the government needs to intensify efforts environmental sanitation and the cleaning of the Nyanya-Karu-Jikwoyi road dumpsite. “If there should exist dumpsites, the government should ensure that these are not located around residential areas or public property. “Environmental agencies need to educate individuals on the benefits of sorting waste from source and the immense rewards that can be accrued from recycling. “The people also need to ensure that when trash bins are situated in their locality, they dispose waste properly rather than litter on the floor that gradually becomes a dumpsite over time. “There also has to be an enforcement of law that stipulates that waste workers or mai-shara, as they are popularly called, are punished for indiscriminate waste disposal’’, she suggests. Mr Sunday Nwabugwu, an environmentalist with the British Council, observes that indiscriminate dumping of refuse has tremendous negative impact on the environment. “Chemicals and other dangerous contaminants found in solid waste seep into our ground water and they are also carried by rainwater to rivers and other sources of drinking water not just for humans but for animals’’, he says. According to him, dumping refuse anywhere close to human residences or where they carryout businesses is not proper because the wastes are sources of contamination due to the incubation and proliferation of flies, mosquitoes and rodents. “Emissions from dumps too close to homes also cause respiratory diseases as contaminants are absorbed from the lungs into other parts of the body’’, he explains. Nwabugwu says indiscriminate dumping of refuse is unpleasing to the eyes and detrimental to the natural beauty of anywhere, especially when visible from the roadways. “One of the important economic impacts created by the solid waste is the impact on residential property values. “Apart from this, residential property values are affected by the generation and management of solid waste. “The social impacts include the unpleasant odour when garbage is left uncollected and the substance it emits. “It also breeds mosquitoes, worms, insects and flies and the release of smoke and poisonous gases giving rise to safety problems’’, he says. Nwabugwu pleads that government must take responsibility for the control, collection and disposal of garbage, especially at indiscriminate places. He also advises that the government should put in a structure to ensure defaulters are penalised for their actions to restrain people from indiscriminate dumping of refuse. FEATURE: Will `League Of Governors’ In 9th Senate Make A Difference?